Winter has waged war in my yard this year, alternating between bitter cold and unseasonable warmth. Advancing and retreating, often in the same week, bitter cold days of single digits give way to days in the fifties and even sixties. Ground that was frozen and buckled with ice crystals for days suddenly turns to mud. Because of the intermittent warmth, some plants still cling to green leaves. My yard has its own climate, a north-facing slope that rarely sees sun, with much of the level floodplain of my creek shaded by a steep bluff. Snow lingers for days in my yard after it has melted in yards across the street. I wander the woods of my own private wonderland, feeling as if I am in a parallel universe. This view of my forest with sunrays filtering through the ephemeral morning fog is a typical scene for me this winter. Having spent some years in the tropics, I ultimately chose to settle in a place that shared the climate of my childhood. 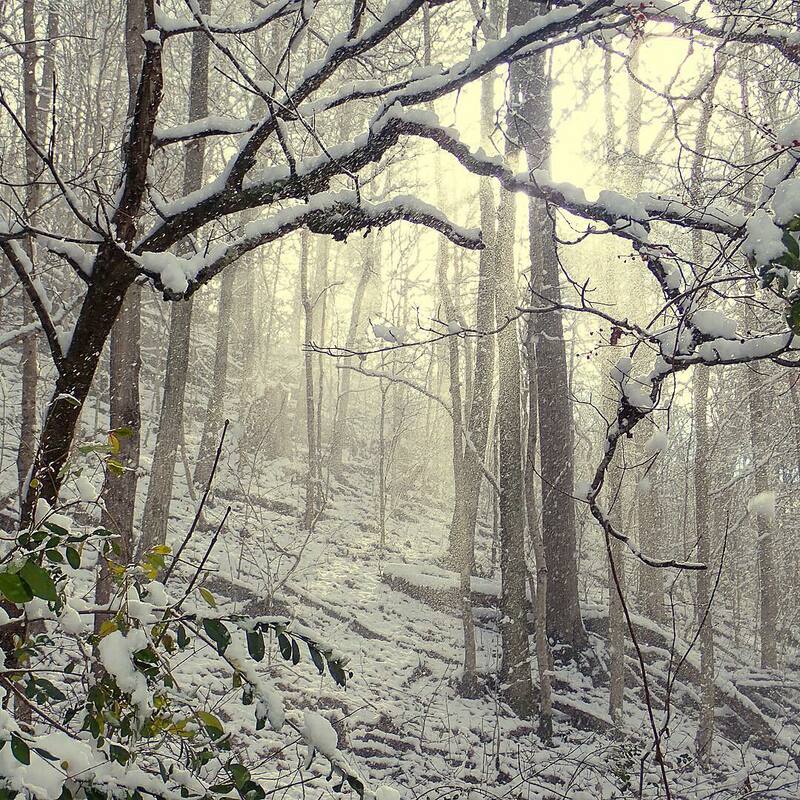 Here in the mountains of Tennessee the seasons are closer to the calendar than anywhere I’ve lived. None arrive too soon or stay too long, and I appreciate them even more because of their fleeting nature. This year the extremes of the season seem to seesaw back and forth, but the essence of wintertime remains. I revel in the stark but elegant beauty of a black and white landscape. Wrapped in the white silence of a snowy day, I can’t help but see remnants of what came before, and hints of what is yet to come. But for this instant I push these thoughts away and admire the perfection of this moment, unique as the snowflakes drifting through the filtered sun.